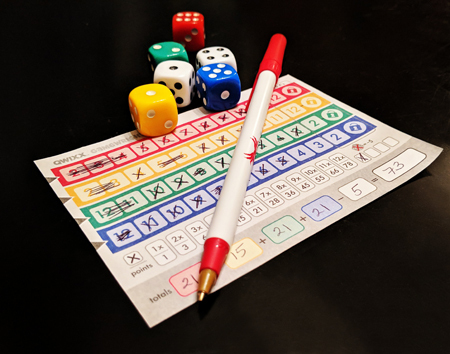 Qwixx: One of the favorite games played at Shakes Manor! Here is a thread for discussion of all things gaming: Board games, card games, video games, dice games, role-playing games, strategy games, party games, whether you play in groups or on your own. Tell us all about the games you love! As I've mentioned several times previously, at least once with an adorable photo, Iain and I love the board game Talisman. The number of hours we've spent nerding out to Talisman, I don't even know! If you're into fantasy adventure games, I can't recommend it enough. It's so, so good. Anyway! We've always wanted to get the Highland expansion, but it went out of print before we got it, and now it's only available for hundreds of dollars. Ughhhhhhhhhhhh! So this is my plea that if anyone who's into gaming happens to see one at a second-hand shop or garage sale or anyplace where I can procure it for a price I can afford, please let me know! I promise it isn't because I want to resell it! I WANT TO PLAYYYYYYYY IIIIIIIIIIIT! What game(s) have you been playing lately?